Meet Jessica , Vitality Yoga's creator and board certified psychiatric mental health nurse practitioner. Learn why she is dedicated to the art, science, & practice of holistic mental health care and wellness and trauma informed yoga therapy. Children, adolescents, and adults in Northwest Arkansas seeking mental wellness services for relief from anxiety, stress, trauma, depression, among other mental health disorders can benefit from traditional mental health approaches such as psychotherapy and medication management; alternative approaches such as trauma informed yoga therapy or equine integrated psychotherapy; or a combination of techniques. Our goal is to help you find long term healing by learning how and why your body reacts to stress and how to self regulate your breath, body, and thoughts. We accept Blue Cross Blue Shield Insurance and self pay patients. 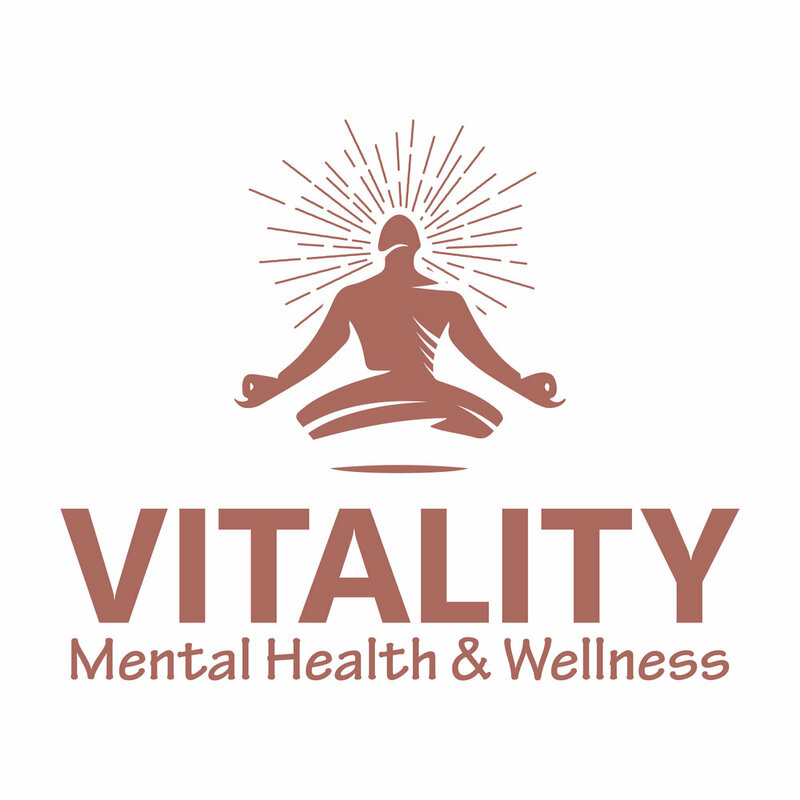 At Vitality Yoga, we offer traditional, alternative, and complementary mental health services. A major framework of our practice is trauma informed yoga therapy which focuses on breath, body awareness and movement, mindfulness, and meditation. These practices are evidence based which means research shows that when practiced as prescribed, you WILL experience improvement in your symptoms and quality of life. In addition to one on one, individualized sessions, you will receive printed materials/videos/audio recordings for your home practice, an individualized plan to meet YOUR goals, and instruction on a multi-faceted approach to find healing, wellness, and wholeness from the top down and bottom up. You will also be able to contact us between sessions should any questions arise as you practice your new holistic wellness skills. We are located at 1501 SE Walton Blvd Suite 203 in Bentonville less than 5 miles from the Bentonville Square and Crystal Bridges Museum. You will find us on the 2nd floor right above Bizzy B's Bakery (elevator and stair access) and across the street from Krispy Kreme and Panera Bread. We are less than 1/2 mile from I-49 making up easily accessible in Northwest Arkansas! We’re loving getting to hang out with the community and other mental health providers from NWA! Thank you @woodlandresearchnw for hosting this amazing event to share community resources! This low impact, detoxing 8 week series is coming to Vitality with @poweredbyheart !My husband and I practiced this series every day for a week at a yoga retreat in Mexico earlier this summer, and I couldn’t wait to bring it back to the studio to share! It is a challenging beginner series that will strengthen, lengthen, and detox your body! Register for all 8 classes for a discount or register for single classes. Spots are limited, so sign up now! Please join us this Sunday September 9th for the NWA Out of the Darkness Walk. We are excited to be a sponsor for this event and support the American Foundation for Suicide Prevention's mission to reduce annual suicide rates through "new research, educational programs, advocating for public policy, and supporting survivors of suicide loss." The walk begins at 3pm at Orchard's Park. Come find our tent between 1 and 3PM where will be offering meditation sessions and would love to meet you in person before the walk begins. The fall line of LifeCo oil blends drops TODAY! I am so lucky to share my practice space with Caschelle and LifeCo and to call her my trusted wellness partner and friend. One of the best parts of our relationship is that sometimes I get early access to her amazing products. I’ve had these oils in my house, my camper, in my yoga therapy sessions, on myself...pretty much everywhere I can diffuse or wear them since last Thursday. Bonfire, Fall Y’all, and Jeans & Hoodie...they are all so yummy and definitely delivering the spicy/comforting autumn vibes 🍂🍁🌼🍎🧡🎃! Head to https://www.lifeco.guru/ to order your own organically sourced, locally blended, nontoxic fall oil blends and fill your space with the scents of the best season of the year (or pick them up at Vitality) ! Only 4️⃣ spots left for this life changing series! Your registration gets you 4 cooking classes with natural foods chef Lindsey Hardin including seasonal cooking tips and recipes, enjoying the delicious recipe creations at the end of every class, community with others interested in plant based cooking, and an optional yoga practice before cooking class starts. Call Lindsey today to register at 479-903-5022. ☀️ Wellness Sunday ☀️We live in a beautiful state. Getting to a natural, forested area doesn’t take much traveling in Northwest Arkansas. I love to get outdoors as much as I can for my own health regimen, so I spent this weekend hiking and camping. I also recommend my clients consider getting out in nature as part of their wellness routine! Here is what evidence tells us about the effects on health and wellness resulting from spending time in nature: 🍃 Decreased anxiety and rumination 🍃 Decreased blood pressure and pulse rate 🍃 Decreased cortisol (stress hormone) 🍃 Increased parasympathetic (rest and digest) nervous system activity 🍃 Increased awareness of the details of your surroundings 🍃 Increased overall health from physical activity and Vitamin D 🍃 Increased feelings of connectedness and presence Mental wellness is more than an hour a week spent with a professional - it’s a daily lifestyle. Let’s work together to find a routine that works for you! Incorporating rest into every day is so important. It took me a long time and a lot of experiences of full burn out before realizing that rest is crucial to wellness. Whether it’s stopping for 60 seconds during my workout to let my heart rate and breath slow down; taking a child’s pose during yoga practice to reconnect with my breath; taking a 5 minute meditation during the work day to create space between my thoughts; taking a 30 minute nap; getting a full 8 hours of sleep; or taking a vacation for extended hammock time - REST IS LIFE! Make some time for yourself today. Give your body the break you deserve! Look up the definition of health and you will find that health is not merely the absence of symptoms. Health is a complete state of physical, mental, and spiritual well being. Health is the ability to adapt to stressors and use your own resources to lead a full life. This is why our approach at Vitality Yoga focuses on holistic healing and wellness. We will help you find the daily tools in all domains of health that are right for you to build resilience and achieve not just the absence of symptoms, but level up to a full and joyful life. It’s possible and we’re here to be your guide! Are you looking for mental health care options? We are a mental health care practice owned by a licensed and board certified advanced psychiatric/mental health nurse practitioner offering psychotherapy, trauma informed yoga therapy, equine assisted psychotherapy, and more services coming soon. Reach out to find out how we can use traditional, alternative, and combined options for your healing and wellness. We can make a plan. We’re here for you. The fall semester is in full swing and I’ve found myself facing another week of crazy schedules and needing to somehow figure out how to prepare the nutritious food that’s going to fuel my brain and body and meet my goals to have fruits and veggies make up the majority of my meals. Our upcoming Plant Based Cooking Class with @kitchengongfu is just around the corner and is going to be a game changer towards these skills. I cannot wait to fill my tool box with new cooking skills and recipes and how to use up all the produce in my fridge before it goes bad! Pre-register today and let’s learn together! Do you know what you are? You are a manuscript of a divine letter. You are a mirror reflecting a noble face. This universe is not outside of you. Look inside of yourself; everything that you want, you are already that. Rumi We’ve got so many options to guide you towards looking in and shining out! 💫🌟✨ Call us for an individual evaluation and let’s get started! Meditation, warrior poses, and simply breathing on your mat take on a whole new level of awesome with the presence, support, intuition, and wisdom of therapy horses. Yoga with Horses is happening again on Saturday August 25th at 9am at @couragetrc ! It is a donations based class with all proceeds benefitting Courage and their programs. Come out for a self care Saturday and get in on the magic!